William Shakespeare, Marie Curie, Mozart, Galileo, Helen Keller and Michelangelo can now appear in school classrooms using modern multi - media technology. Our aim is to provide every teacher and all students, via streamed media, access to amazing people from whom they can learn and be inspired. For further information on how educators can get involved, please see HERE. The Amazing People Club is a publishing organization that has produced the life stories of amazing people through virtual biographical interviews, which are known as BioViews®. Each of the stories is produced for students in an easy to read style and written in the first person singular as shown in the short excerpt below. 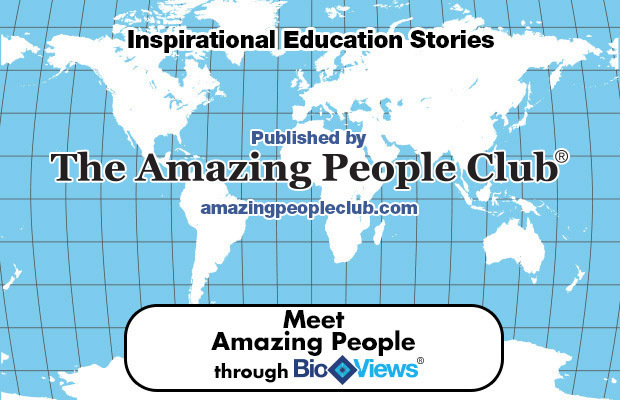 There are over 400 BioView stories in the Amazing People Education Series. They have all been recorded by actors in an audio studio. A number have also been produced as avatar based audio visuals for use by teachers and students in the classroom. Each of the audio visuals can be used at the start of a class on key issues in the curriculum, such as science, music, art, literature mathematics, health and other issues. These resources are fully supported by timelines, articles, portraits, etc. To view an avatar example of Captain James Cook, please see HERE. Research is being done on the effectiveness of this approach and the following points have emerged so far. Identification - Students take more interest in the content of a subject area, when they have an identification with a leading person involved. An example is the topic of Exploration and Navigation. After a five minute version of our Christopher Columbus audio visual avatar was shown, the teacher and students reported that interest in the topics was shown. You can view the Columbus avatar HERE. Engagement - The level of student engagement was reflected in the level of participation in group work and also the class discussion that followed. Amazing People World is a new web site established to provide access to the amazing people audio visuals for teachers and students. Train teachers in the use of the amazing people audio visual resources. We will make available, our resources that suggest how teachers could use BioViews in classroom applications. This will also be supported by an Amazing Teaching Strategies Toolkit for teachers to use at will, to facilitate group discussions. See HERE. To gain feedback on the application of the resources in the classroom, preferably via a video recording of student discussions, plus interviews with students. To see an example of how this was done at Castle Vale School in the UK, please visit HERE. To gain feedback from teachers on their applications and their assessment of the effect audio visual avatars have on the student’s motivation and commitment. To provide teachers with the support resources for continuing professional development associated with Amazing People Education, including an innovative approach to the critical thinking and problem solving.